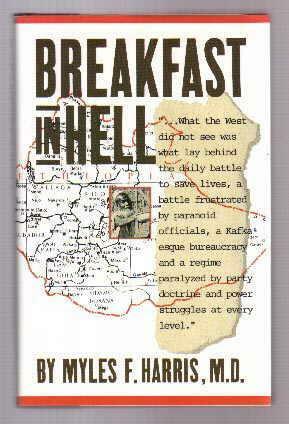 Breakfast in Hell is the story of a Red Cross doctor and his time in Ethiopia during the 1984 famine. During this time in Ethiopia, Mengistu was in power, the country was powerfully influenced by Russia, and as usual, political posturing was more important than helping the less fortunate of the country.Dr. Myles Harris arrived to help people, but spent most of his time fighting with officials for the tools he needed to do his job. At every corner he was met with a new rule, or piece of paperwork that delayed him. When he was finally sent to Sodo, he learned the famine there was essentially over. Meanwhile the real crisis was unfolding in Bati. After many months, he arrived and began his work. “The absurd politics came to mean less and less as the days passed. By the time we arrived in Bati it was far too late to do anything—even if we had had the power—about the ravages of incompetent agricultural policies, brutal Party hacks, the desert war, simple indolence, or even plain greed.”It was a sobering book. It happens everywhere. Politicians always think looking good is more important than actually helping people. I don’t think our new President feels that way, so I have some optimism these days. I had read nothing about modern Ethiopia beyond newspaper and magazine articles when a Yugoslavian friend who had gone to the American high school there recommended this book. Harris is no great writer, but he does certainly convey his anger at those who made famine relief work there very difficult for him and his team.